How to download and install SoapUI on Windows systems? Here are the steps to download and install SoapUI on Windows system. 2. 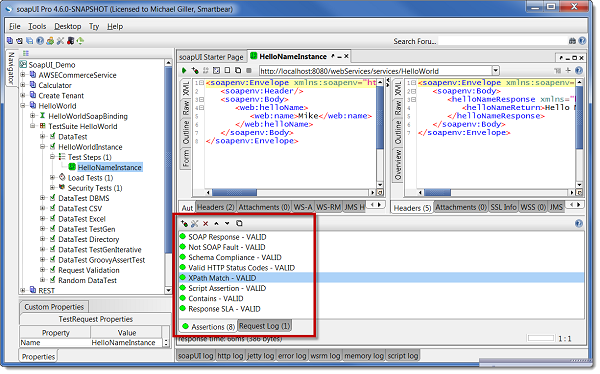 Click Files > soapui > 5.1.3 (or the latest version). 3. Click SoapUI-5.1.3-windows-bin.zip (2015-04-08, 51.1 MB) to start download. 4. Unzip the download file to a folder like C:\fyicenter\SoapUI-5.1.3. 5. Double click on C:\fyicenter\SoapUI-5.1.3\bin\soapui.bat file to run it. JAVA_HOME is not set, unexpected results may occur. To fix this error, you need to download and install Java. And set JAVA_HOME environment variable to the Java home directory.  2016-06-17 FYIcenter.com: Thank you, Erik. We will try it.  2016-06-16 Erik: SoapUI 5.2.1 is available now. Check it out!